Just in time for April Fool’s Day we are pleased to announce the results of this year’s Grove Music Online Spoof Article contest. 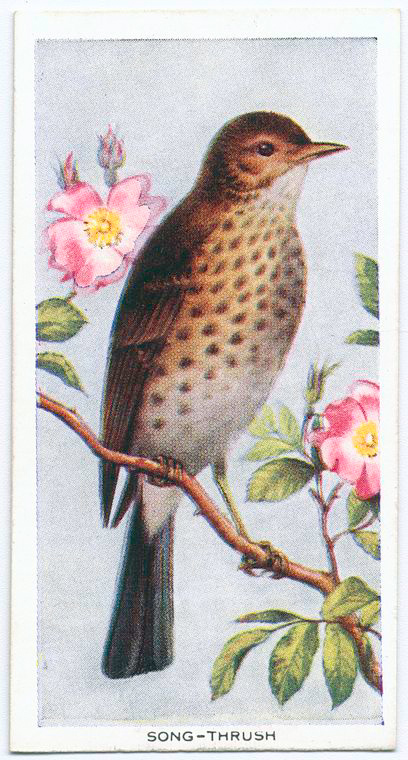 Song thrush. Digital ID: 1132614. New York Public Library. Deane Root, editor in chief of Grove Music Online, and Professor of Music, Director and Fletcher Hodges, Jr. Curator of the Center for American Music, University of Pittsburgh, has been immersed in Grove style since he worked under Stanley Sadie on the first New Grove Dictionary of Music and Musicians. Charles Hiroshi Garrett, Associate Professor of Musicology at the University of Michigan School of Music, Theatre & Dance served as editor in chief for The Grove Dictionary of American Music, Second Edition. He is currently working on Joking Matters, a book that explores music, humor, and contemporary culture. Anna-Lise Santella edits Grove Music/Oxford Music Online as well as the music modules of Oxford Bibliographies and Oxford Handbooks Online. She spends a lot of time with style guides and once read the 1927 edition of Grove cover to cover for fun. We received a number of excellent selections, all of which observed Grove style and took care to include some plausible details among the ludicrous so that they might pass muster. Bach, Davide Adolphus Iestyn (b Rimsting, Bavaria 29 Feb 1764, d Merthyr Tydfil, Wales 22 Apr 1833), German composer, organist, and political agitator. A distant relative of J.S. Bach, D.A.I. Bach’s early career is veiled in obscurity. It is known from the personal letters of his father, Johann Maldwyn Bach (1740 – 1800) that D.A.I. Bach moved to the home of his paternal great grandmother in Fochriw, Wales in 1785 following a failed attempt to poison the Elector of Rimsting in protest about the feudal laws still employed in Bavaria at that time. He is credited with establishing the tradition of Lutheran hymn singing in Wales, translating Ein Feste Burg into Welsh for the Eisteddfod at Corwen in 1789. His most famous work is the ‘Steam’ Cantata (Schnell, Schneller, am Schnellsten!) written to celebrate the first journey of Richard Trevithick’s steam engine from Merthyr Tydfil to Penydarren in 1804. He was implicated as a ring leader of the Merthyr Riots of 1831, describing himself as a ‘solider for freedom’. He escaped punishment by disguising himself as an iron worker at the famous Dowlais works. His opera Uumo di Ferro, a semi-autobiographical account of this episode, was revived in 1987 as part of the Urdd Eisteddfod in Merthyr Tydfil. Bach’s involvement in Welsh political protest earned him a reference in the folk song Sospan Fach (‘D.A.I. Bach y sowldiwr’). In a cruel twist of fate, D.A.I. Bach died on the same day as Trevithick in 1833, following a railway accident. Root notes, “Another long-lost member of the prolific family: a cwrthed Bach perhaps? Surely those lacking facility with the Welsh language are missing some humor here (“dai bach” means little David, raising expectations for references to slingshots and giants).” Judge Santella added, “This article gets bonus points for including references to actual events that leant it the air of plausibility and for including Welsh phrases that stood up to my (admittedly limited) translation abilities. It lacked, however, a signature, which is not only a missed opportunity for additional hilarity, but also against Grove’s preferred style for an article that includes bibliography. This article was submitted by Steven Griffin. Humble, Maria Felicity (b Hampshire, 1762, d Hampshire, 1813). English composer and pianist. Initially denied the musical tuition bestowed on her four brothers, Humble was eventually permitted to attend lessons by her parents, a vicar and his wife, after her threat to hold her breath for a dangerously long time led to an incident in which the parish doctor had to be called, at considerable expense and embarrassment to the family. This was the last in a series of subversive acts undertaken by Humble in protest at her exclusion; others included doctoring her father’s sermons shortly before church services, resulting in some unfortunate declarations from the pulpit. Humble proved to be skilful and naturally musical, soon outstripping her brothers in her aptitude at the keyboard, and in her understanding of harmony, counterpoint, singing, and composition. The resultant humiliation felt by her brothers manifested itself in a number of resentful gestures, including the destruction or defacement of many of Humble’s scores. Of those that survive, most bear the marks of sibling rage, with one set of handwriting in particular – identified to be that of her youngest brother, Percy – revealing a highly scatological mind. Humble resorted to keeping her works locked in a bureau; as a consequence, none were performed or published during her lifetime. Pieces include numerous highly accomplished songs and piano sonatas, some of which have been hailed by Charles Rosen as ‘superior even to Beethoven’. Fogger-Houndsmilk, George (b Guildford, 24 August 1937, d Kingston upon Hull, 26 December 1999). English composer, pianist and folksong collector. He was educated at Winchester College and then at Hull, where he encountered the poet Philip Larkin (1922-1985). Fogger-Houndsmilk, who was published under the name George Houndsmilk, set Larkin’s poetry to music in his song cycle, The Librarian (1956), but Larkin dismissed him as ‘a second-rate churner of dubious ditties’. The cycle was published incorrectly as The Libertarian, but was so successful in that guise that Houndsmilk made no attempt to alter the title in later editions. Houndsmilk enjoyed considerable commercial success with his settings of English folk music. Songs include Rosemary Cheesecloth, Plump Puddens, Bishop Littlebreath’s Farewell, The Saucy Skipper of Scarborough, Lewisham Fair, Shropshire Blue, Sweet Catford Sue, Newcassel Town Hall, The Red-breasted Merganser of Merseyside, Slippy Willie, and Seven Farmers Went A-Drinking and Never Came Back. Houndsmilk’s settings were issued by the eminent publisher Henry Cassocks. Houndsmilk married Hattie Bloxham, a former barmaid celebrated for her forthright singing style. Bloxham gave numerous recitals of Houndsmilk’s songs, with her husband at the piano. They had six children, including the poet and literary critic Celia Bloxham-Houndsmilk. George Houndsmilk died of injuries sustained during the collapse of a negligently-constructed wheelbarrow. Henderson, Lucas John (b Philadelphia, 19 June, 1910, d Appenzell, Switzerland, 27 November, 1987). American composer. His style encompassed the avant garde and, later, post-modernism, including works which paid tribute to, or satirised, the music of other composers. His 1956 piece, Cage, an homage to John Cage, consists of a cage, the bars of which have been loosely interwoven with violin strings. The performer, who need not be a violinist, is required to pluck the strings while emulating the movements of a bird. In a follow-up to this work, Byrd-Cage (for performer, cage and tape, 1958), a recording of Byrd’s motet Siderum rector is played throughout the performance. When the original score to Henderson’s satirical fusion of Stravinsky and Beethoven, Oiseau de für Elise (for voice and Bunsen burner) was destroyed by fire, Henderson ceased composing altogether, retiring to a life of quiet solitude in the Swiss village of Appenzell. Judge Root opined, “The name puns here are surprising and delightful, as are the inventively prepared birdcage and the implied hazards of modern-music performance. This mashup of music composers, styles, and titles—brief though it be—earns my nod as our spoof-of-the-year.” The rest of the judges agreed. “It’s the only one that made me laugh out loud,” said Judge Garrett, and Judge Santella admitted it was the perpetrator of the aforementioned coffee incident. Congratulations to author Joanna Wyld, who also wrote the First and Second runner up entries. She is the winner of $100 in OUP books and a year’s subscription to Grove Music Online. Many thanks to all of our entrants for your creativity! We hope you’ll join us again next year! And finally, our original contest announcement elicited our first ever errata correction for an earlier spoof article. William Walderman wrote to correct the article on Dag Esrum-Hellerup, which appeared in the first printing of New Grove 1. The Grove article on Dag Henrik Esrum-Hellerup contains a serious flaw. 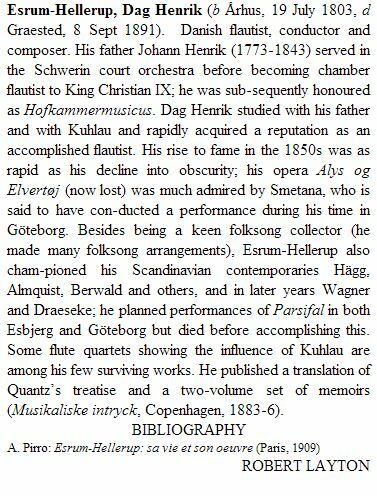 Dag Henrik’s father, Johann Henrik (1773-1843), supposedly appointed chamber flautist to Christian IX, died 20 years before Christian’s accession to the throne in 1863. We tried to slip one by him by stating that it must have been Johann Henrik’s long lost identical twin brother, Johann Maria, who lived to the ripe old age of 110, that served under Christian IX, but he was too quick for us! Are you sure it was Johann Maria – a Catholic name in a Protestant country? With the surname Esrum-Hellerup, these twins weren’t arrivals in Denmark from Bavaria or the Electoral Palatinate. Maybe his name was Johan Martin Esrum-Hellerup (probably Johan, with just one n, or else Hans or Jens). It’s certainly difficult not to admire the lungs of a 90-year old flautist. We certainly can’t argue with that. Thanks for your comments, Mr. Walderman!